Teams are the pulse of every successful business, cialis sale viagra and without them many cannot operate effectively. Team building gives businesses the tools they need to build efficient and productive teams. Dr. Paul Gerhardt’s innovative team building methods have been used by government and private institutions in small, physician medium, and large businesses around the world. Learn conflict resolution techniques that enable team members to move forward instead of harbor resentment. Through team-building exercises and proven techniques, no rx Dr. Paul Gerhardt is able to diagnose any problems that may be hindering the team, and work with members to develop a plan of action to build a better functioning unit. Dr. Gerhardt possesses the education, experience, and passion for career development and leadership that has earned him the title “Organizational Doctor” by colleagues and clients. Developing your team is an investment in your company’s future that can be seen in every part of your business including the bottom line. If you take care of your employees they will take care of your business. Investing in your company’s most valuable assets – the employees – sends a clear message that you are interested in more than the profit. Employees are more loyal, more productive, and more creative when management makes it clear that they value their employees’ input, and are invested in their personal development. Experience firsthand the results that many other organizations have seen after Dr. Gerhardt’s team-building seminars. His interactive approach alongside his wealth of knowledge leaves teams feeling more confident and better prepared to face the challenges teams face in their workplace. 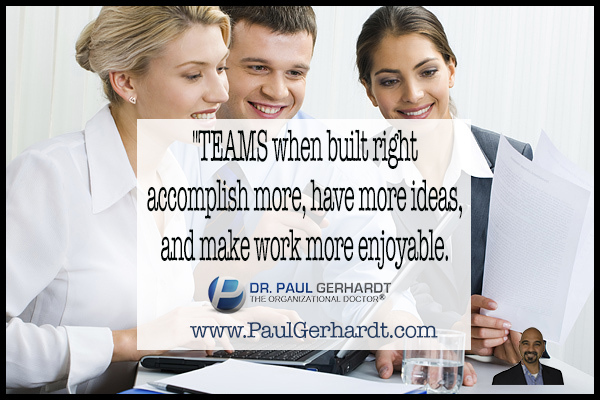 Contact us today for a free, no obligation consultation about the benefits of team building with Dr. Paul Gerhardt for your organization.